If the filter wasn't there, you might not notice the pump and hoses tucked under the hood. Adding filtration to the hydraulic system seems like a good idea. Unfortunately, the low pressure suction side of this system does not work well with any restriction. Even with the modern full-synthetic fluid, the filtration caused pump cavitation in cold temperatures. The hydraulic system on these tractors was designed to plow, and it does that very well. Start using the 3-point lift with other implements, and the lift system may not operate as we would like. While stepping on the clutch, the lift will not raise. The work-around for that is to start raising the implement before getting to the point where we have to stop and back up. This can be learned, but there always seem to be cases where the foot has already hit the clutch and the implement is still down. The lift will only work if we can find a way to releas the clutch pedal. It would be so much easier if the 3-point lift would just go up whenever we raise the touch control lever. Adding an external pump will make that happen. In some cases, an external pump can be used to avoid rebuilding or replacing the internal pump. Installing and connecting an external pump can be done for less than the cost of a complete rebuild or for about what it normally will cost for a good used replacement pump. Top cover gaskets, lift piston, and valves in the tractor pump do need to be in good working condition. The touch-control linkage should be in good shape, and properly adjusted. A 3-point lift should not drop to the ground when you step on the clutch, it should stay at whatever level you were just using it. If your lift drops as soon as you hit the clutch or as soon as the engine is turned off, that's a problem. Any problems with the hydraulic lift system need to be fixed before we do anything else. If the internal pump is just old, and not putting out much volume, an external pump should "fix" the system. 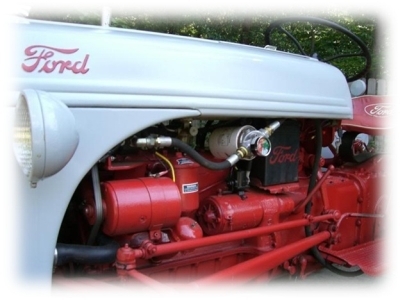 An external pump will provide hydraulic pressure even when the PTO is disengaged. An external pump will not make the PTO shaft keep turning when the clutch is pressed. Please refer to my HYDRAULIC SERVICE PAGE to see what I have regarding hydraulic system repairs. This is an estimate of probable costs for YOU to buy and assemble a live hydraulic system in your spare time. I moved this to the beginning on purpose. If the cost is going to exceed your budget, this will save you a bunch of reading. Be prepared to spend some money, Hydraulic parts are not cheap. Prices are constantly changing (usually UP). Shop around, and see what you can find. Used or Surplus hydraulic parts are perfectly ok. Beware the Made in China stuff. For some things the quality is very good, for other items, not so good. Add for options such as: Suction Strainer, Quick Disconnects, Larger Pump, Valves, By-Pass, etc. It takes lots of time, and shipping charges to assemble all the parts that make up kits. There have been very few people willing to spend time and money to assemble complete live hydraulics kits. To my knowedge, for the last 10 years or so, there have only been two people offering Live Hydraulics kits for these tractors. The best way to assemble a kit is to do your own shopping. At the very least, you save the cost to ship all the stuff twice. This how-to has all the information necessary for any do-it-yourself handyman to put a system together. Any kit has to assume the tractor is original. That is often not true for these tractors. Some fittings and fasteners may have stripped, been drilled out, and tapped larger. Look carefully at the test port on the belly pump. There should be a large bolt facing your right heel when sitting on the tractor. 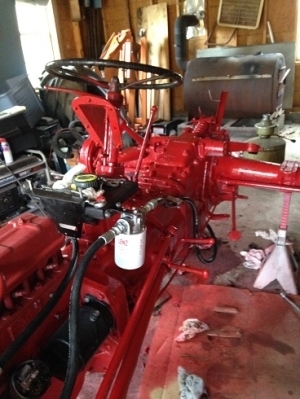 If this connection has been "rigged" with any other hardware, or if the pump housing is cracked and leaking at this location, the external pump cannot be properly connected to the tractor. 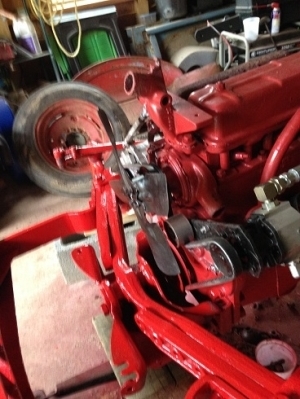 It is impossible for any kit to anticipate all the ways a 50 or 60 year old tractor may have been altered. If you can cut and weld your own pump bracket, plans are provided in this how-to. All of my bracket designs were originally cut out with a reciprocating saw, hack saw, and smoothed on a grinder. If you have scrap steel laying around, something to cut it with, and a welder, the bracket is a fairly easy metalworking project. It only has to work, it does not have to look as pretty as my professionally-cut bracket parts. Start adding options like quick disconnects, valves, and external hydraulics to the system, and the price goes up very quickly. Honestly, it is often much less expensive to sell the 8N and buy one of the tractors just a few years newer that will already have live hydraulics, more horsepower, a stronger front axle, and other factory improvements. The information here can be used to add hydraulics to other tractors, or basically anything with an engine. Coming up with a mount for the pump is the biggest challenge. Here's an example of a pump bracket with an idler pulley on a 1949 Ferguson by Dennis R.
This page was getting very slow to load, so it has been divided into chapters. GO TO Next Chapter 2-Engine Driven Pump.